Netflix is continuing to take over the world -- one TV show at a time -- by expanding its services in Asia. The video-streaming provider announced Tuesday that it will be available early next year in South Korea, Singapore, Hong Kong and Taiwan. 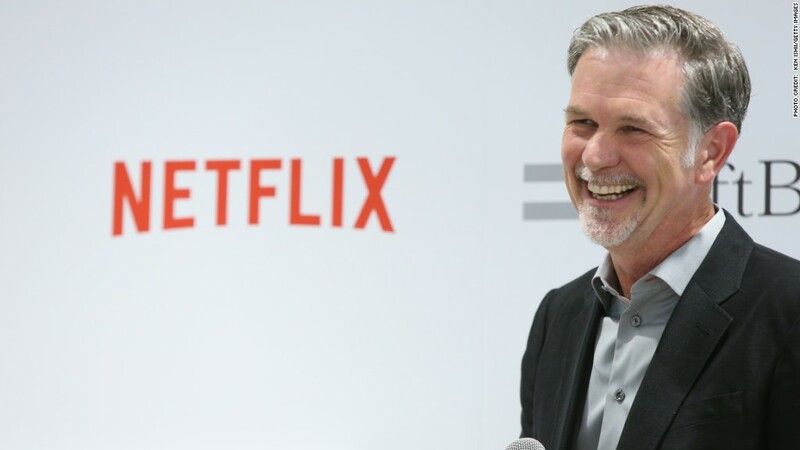 "The combination of increasing Internet speeds and ubiquity of connected devices provides consumers with the anytime, anywhere ability to enjoy their favorite TV shows and movies on the Netflix service," said Netflix CEO Reed Hastings in a statement. "These four markets well represent those trends." Netflix (NFLX) debuted in Asia last week, launching a new service in Japan. Hastings is working on plans to be in every country in the region at some point in 2016 -- including India and China. The company will likely find challenges in China, where media content remains heavily censored by the government and many websites including Google (GOOG) and Facebook (FB) are blocked. It's likely that all Netflix content would have to be vetted before it could be made available in the country. Plus, China already boasts successful homegrown streaming companies. Netflix shares have nearly doubled this year, but suffered some major losses in recent weeks. Shares dropped sharply last week following reports that Apple (AAPL) might be considering a move into original programming. Netflix also decided recently to let its distribution deal with Epix expire, which includes popular movies from the studios Lionsgate, MGM and Paramount. The company didn't provide details on Tuesday about what movies or shows would be available in South Korea, Singapore, Hong Kong and Taiwan.